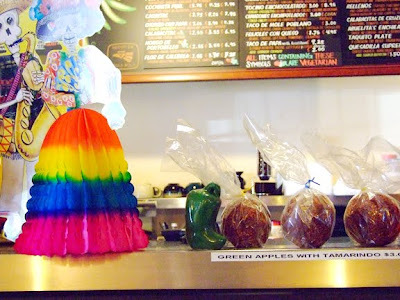 You can read my Edible LA article on Fallen Fruit here. Mary and I walked the same route for our Edible LA photo shoot (in fact, the seated FF interview in the video above is across the street from Mary's house). See some outtakes from our forage/shoot below. And on Sunday Feb. 7, introducing EATLACMA (a year-long investigation into food, art, culture and politics curated by Fallen Fruit—David Burns, Matias Viegener and Austin Young—and LACMA curator Michele Urton) Fallen Fruit will distribute free bare-root fruit trees, requesting they be planted in public space or on the perimeter of private property. This event was chosen to open EATLACMA in order to honor the beginning of the growth cycle, as well as to signal the project’s commitment to changing the shape of our city. EATLACMA will unfold seasonally, with artist's gardens planted and harvested on the museum campus, hands-on public events, and a concurrent exhibition, Fallen Fruit Presents The Fruit of LACMA (June 27-November 7, 2010). It culminates in a day-long event (November 7, 2010) in which over fifty artists and collectives will activate, intervene, and re-imagine the entire museum's campus and galleries. For the holidays this year I chained myself to the kitchen. 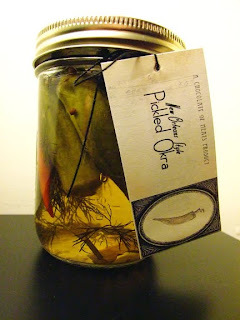 I tried as much as possible to use homemade goods in place of store bought gifts. 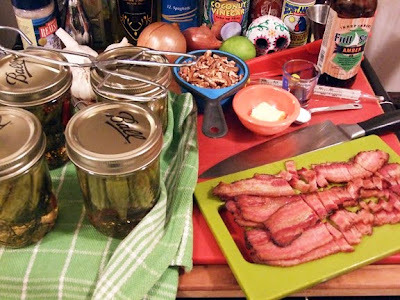 My main two projects were (of course inspired by the South) Pecan Bacon Brittle and Pickled Okra. 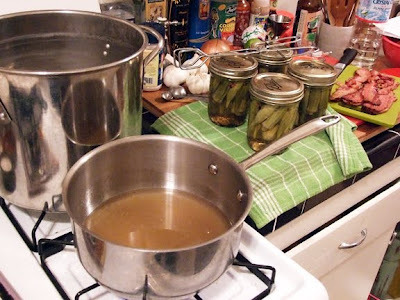 Both went over quite well, so wanted to share the recipes, ma' dear readers. 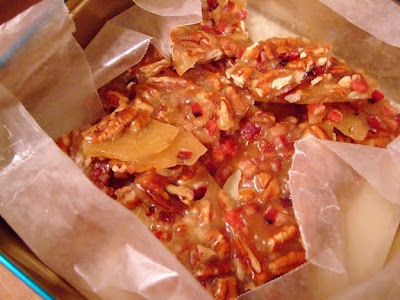 Stir in the butter, vanilla, baking soda, pecans and bacon bits. The mixture will foam. When the foam subsides, quickly pour the hot mixture onto the prepared baking sheet as thinly as possible. Do not spread with a spatula. 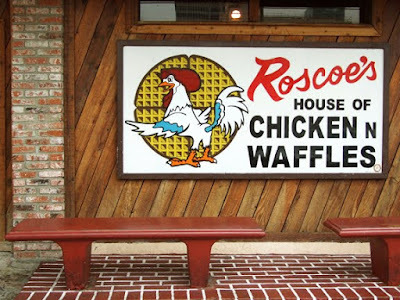 You don't have to be an Angeleno to know about Roscoe's House of Chicken N' Waffles. So tell me how I've managed to live in or around Hollywood since 2005 and never been until late? At any time of day or night you can always count on a scene outside of the wood-sided Roscoe's on Gower in Hollywood, post-bar crowds at times larger than at the clubs. So what's the deal? 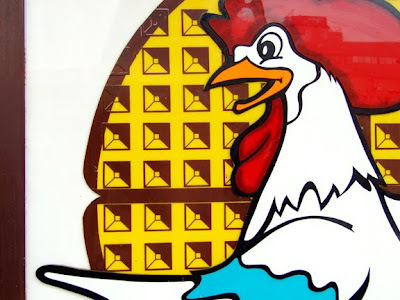 Chicken and waffles: A delicious holy union conceived in Harlem, brought to LA in 1975 by the original Roscoe's, nailing several firsts in the local restaurant scene (then hardly much of a scene at all). 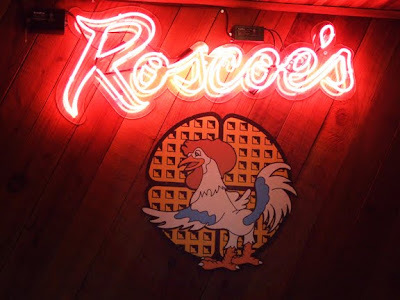 Its originality has seldom been surpassed, as Roscoe's (now with five locations) remains a cornerstone of quintessential quirky LA culture. I recently met my friend David for breakfast while he was in town for work, coincidentally staying just around the corner from Roscoe's. Neither of us had ever been, and both favor a hearty breakfast. We got our early weekend start with some bold coffee and some very full bellies. 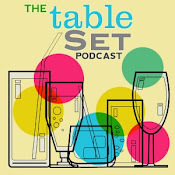 I always appreciate when dining establishments put their specialty right there in the name, because, as a Libra, it doesn't leave much room for indecision. Always order the specialty - that's my motto - especially upon a first visit. Chicken and waffles it was. 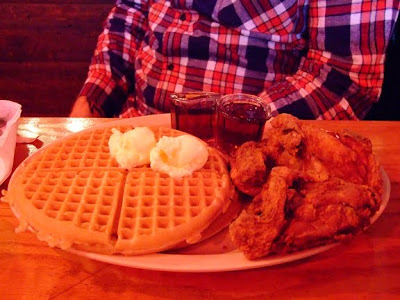 Not sure I was feeling peckish enough for Herb's Special (1/2 chicken + waffles), I went for the abbreviated Scoe's Special of a 1/4 chicken fried Southern Style and two waffles. Tiny feather sticking out of my wing tip aside (yeah.. for real), the chicken was pretty good. Difficult after so recently returning from having the most incredible fried chicken of my life in New Orleans, but it was crispy and tasty. The waffles were perfectly fluffy golden delicious, not thin n' limp or thick n' crunchy like many breakfast joints. And it was a LOT of food. We were satiated. In fact I was so full that, though I was parked right out front, I was happy to walk David back down the street to his place and pretend I was just enjoying the crisp winter morning. My favorite LA neighborhood of late is definitely Highland Park, the residential, small towny Latin wedge of Northeast LA nestled in the shadow of the Mt. Washington, San Rafael, and Monterey Hills, and bridging South Pasadena, Eagle Rock and Downtown. It is one of the oldest settled areas of Los Angeles, and also one of the most scenic, home to "urban oasis" Occidental College, and hosting a quiet youthful cultural burgeoning, especially along York Blvd, with hits such as -aptly named- the York, Good Girl Dinette, Johnny's Bar, or the countless taco shops on wheels, like the infamous La Estrella Taco Truck. 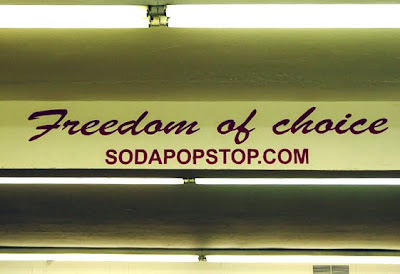 The true hidden gem is a quaint aged supermarket housing the hugest selection of sodas... maybe anywhere! 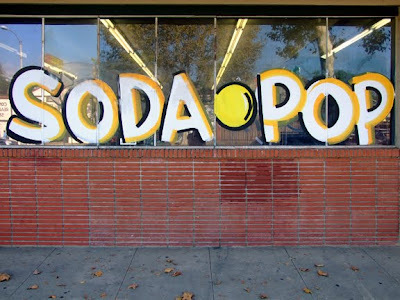 Behold Galco's Soda Pop Stop. 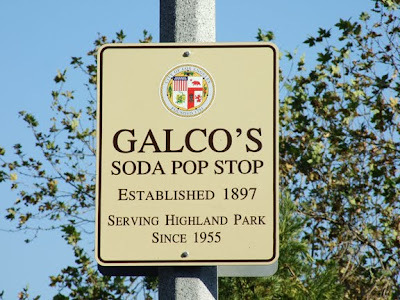 With a historical seal of recognition from the city and countless appearances in print and on TV (AARP, Westways, and Sunset magazines, "Visiting With Huell Howser" on PBS, The Food Channel's "Unwrapped", CBS "Sunday Morning" and "Modern Marvels" on the History Channel), Galco's has been a Highland Park mainstay and attraction since the 1950s. Like a childhood dream, Galco's interior is a wondrous sight. 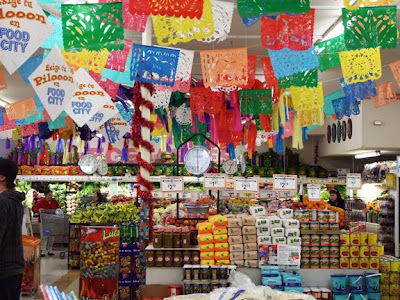 An entire supermarket, shelves stocked with sodas of every flavor, color and origin. 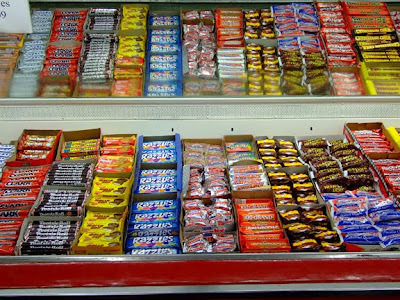 Produce cases lined with old time candies. It's the real Willy Wonka - a modest incarnation, but fully-flavored. A stack of cardboard crates near the door encourages you to start collecting as you explore, which is as much fun to dig into as enjoying the booty itself. 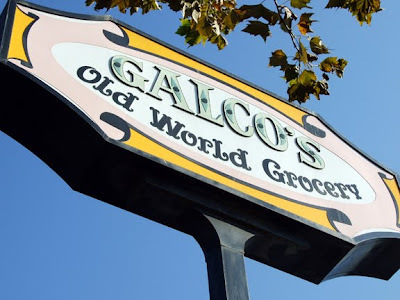 From botanical (rose, violet, jasmine, cucumber) to Cheerwine to Colombian "Kola Champagne" to Moxie... if you've heard of it, Galco's probably has a case somewhere. 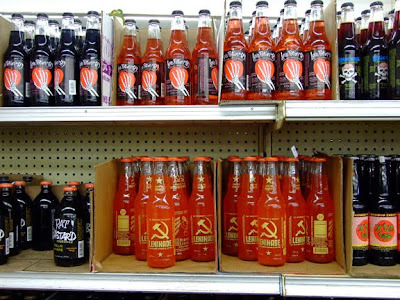 Leninade wins my packaging design award, constructivist chic and tongue-in-cheek tart. 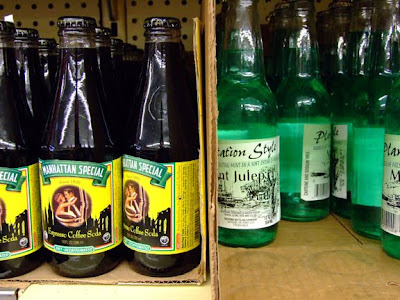 Manhattan Special is one of my favorite discoveries - a real espresso coffee soda - The O.G. Coke Blak! Delicious sparkling espresso caffeine goodness. The neighboring Plantation Style Mint Julep is another popular Galco's selection, a sweet Kentucky virgin julep, ready to be enjoyed out of the bottle or mixed with your favorite bourbon. 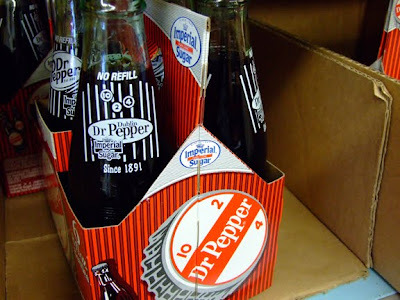 Dublin Dr. Pepper is an easy-to-overlook treasure, besides being the oldest Dr. Pepper bottler in the world, Dublin (Texas) Dr. Pepper also has the distinction of being bottled with Imperial Pure Cane Sugar - the original Dr. Pepper formula. 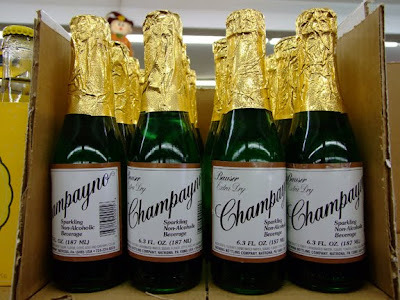 Cuter than Martinelli's. 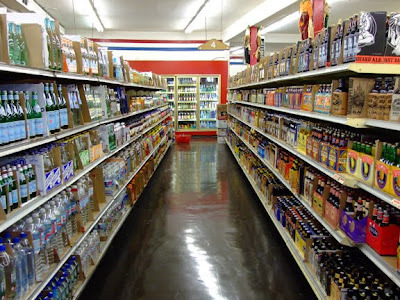 Soda pop aside, Galco's also carries an impressive selection of over 500 different beers - The only place in town I found New Orleans' Abita brewery's seasonal beer this past Autumn, a delicious Pecan Harvest Ale (ace with Thanksgiving leftovers, thanks Galco's). 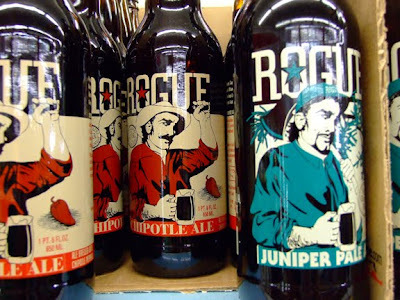 Also the largest selection of Portland's Rogue Ales I've seen locally, including their ceramic carafe-housed XS Imperial collection. So what are some other top findings? 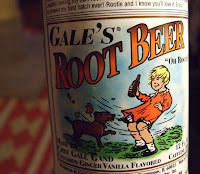 Though there are more than 100 ginger/root/birch brews to wade through, my favorite of the root variety so far is Chef Gale Gand's small batch Gale's Root Beer, with satisfying cinnamon, ginger, and vanilla layers. 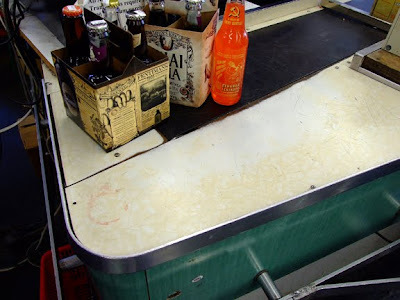 Other root goodies include Abita, old-school Faygo, Olde Rhode Island Molasses Root Beer, and of course classic Dad's in the bottle. 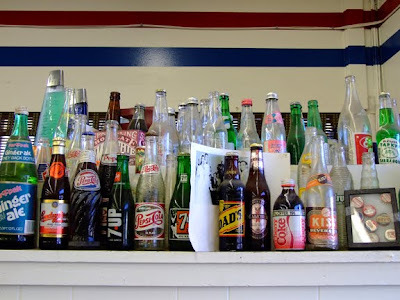 A must for any Galco's visit is one or several of the Fentiman's family of products. Botanically brewed using 100% natural ingredients, Fentiman's produces top-quality apothecary elixirs, possibly best known for their invigorating Curiosity Cola (which I have found to be a magical hangover cure-all), but noteworthy are also their Shandy (0.5% ABV; the only Shandy brewed and bottled in the US) and Dandelion & Burdock brew. 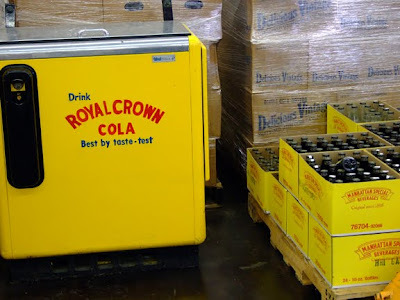 The next time you're stumped entertaining out-of-towners, need an all-ages activity, first date plan, looking for a creative gift, or just plain thirsty... Take a drive to Highland Park and let John F. Nese and his staff brighten your day with a mix-n-match six pack o' sparkles. In a nearby mysterious land known as Eagle Rock, cool things can soar under the radar for ages, effortlessly being cool and raking in passing raves like underground legends. Take The Oinkster, Fatty's, Auntie Em's or Colorado Wine Co., all incredible, yet casually accessible whenever you make the trek out to meet them. 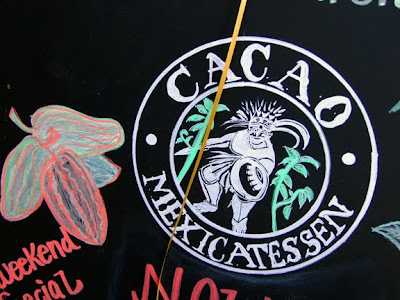 Add a new neighborhood hero to the list, Cacao Mexicatessen. 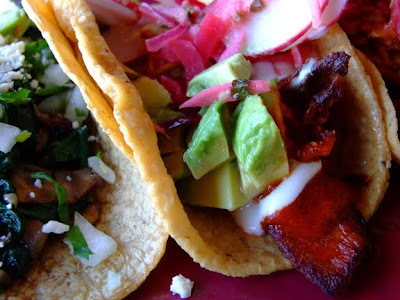 Part taco shop, part Mexican deli, part gourmet Latin food purveyor, Cacao modestly shares a Spanish duplex with a flower shop, and quietly serves the most incredibly inventive and authentic tacos this side of the border. 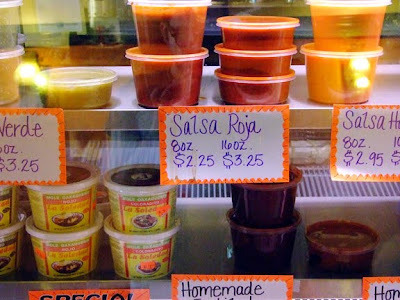 They make and sell all their own salsas, hot sauces and moles. 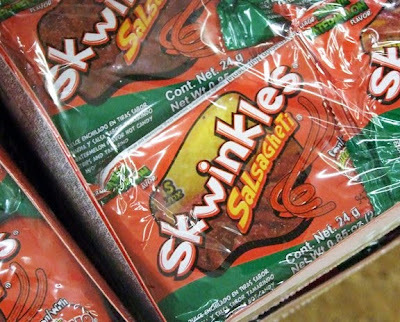 Their cooler case also features an interesting selection of Mexican cheeses, shelves adorned with imported candies, condiments, high-end Mexican cocoa tablets, piloncillo cones, and tamarind coated apples. After taking it all in, we ordered at the counter and sat outside on the quaint patio. Their thin and crisp restaurant style chips (which are bizarrely rare in LA) and spicy puréed salsa already had most of the city beat within minutes of sitting. 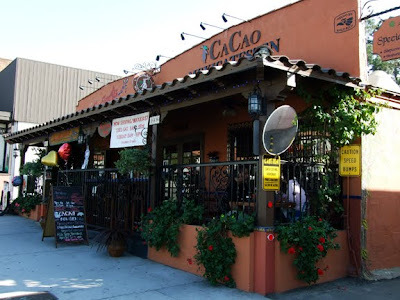 To drink I decided to start with their signature - How can you come to a place called Cacao and not try their Mexican hot cocoa? 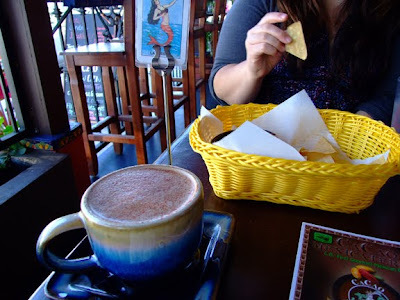 As it was a weekend morning, I opted for coffee with mine and got the Azteca Mocha Latte. This divine (massive!) mug was a rich frothy treat with cinnamon, almond, chile de arbol, and chipotle notes. The spice awoke my senses before the caffeine had an opportunity. I'd certainly come back for this alone. Little did I know, the best was yet to come... Cat and I ordered a sampling of their more interesting taco options (there are many) which came out on a large platter with radishes and fresh lime wedges. 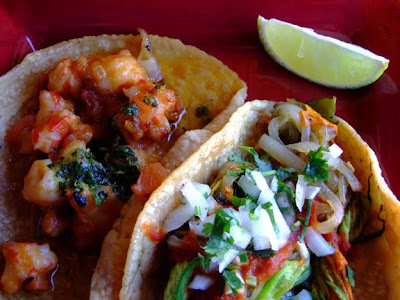 First bite was the Camarones Enchipotlados - shrimp in chipotle with citrus. Tangy, spicy and wet, it was a satisfying start. Cacao's homemade tortillas are larger and thicker than most local joints, with that much more space to fill with the good stuff! Next was a bite of the Flor De Calabaza - squash blossoms, poblano strips, queso fresco. Delicate and lovely! I always appreciate the use of squash blossoms - who said vegetarian has to be boring? The next bite may have been my favorite - the Tocino Enchocolatado - supple bacon, Salsa de Cacao, avocado, and crema mexicana. 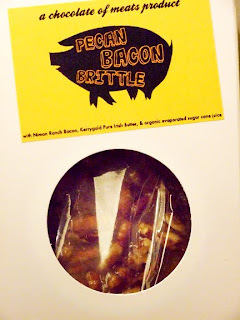 This spicy sweet choco-bacon goodness has to be tried! Unfortunately after that the Hongo De Portobello (Portobello mushroom, spinach, onion, queso fresco) was less than memorable. 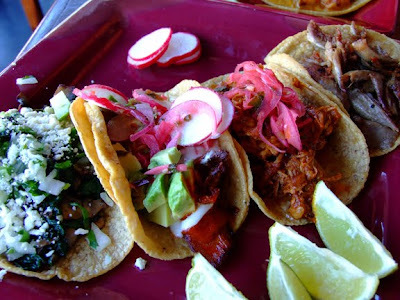 My interest was piqued again with the next two, first the Carnitas De Pato, or duck confit (listed with avocado, vinegar, onion, radishes, chile oil... But mine came with just the duck meat - that aside, it was the most succulent yet crispy duck! Very tasty on its own!). 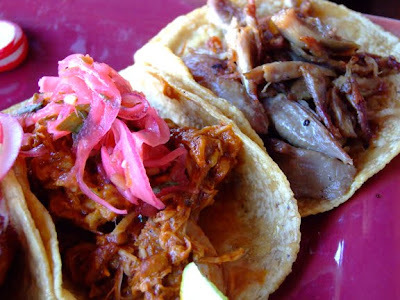 And lastly, the Cochinita Pibil reminded me why I wake up in the morning, a moist robust roasted pork in achiote with citrus and pickled onions. The most satisfying three bites of food anyone could ask for. 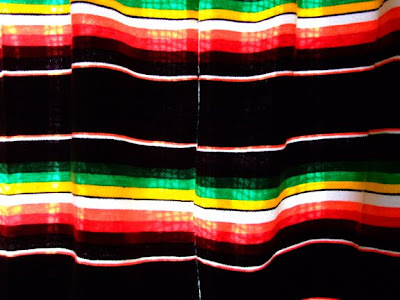 After wiping my brow, and thanking everyone back inside, only a matchbox chocolate tamale stood between me and the sublime.